Catching up with our editor in chief can be a tricky task. Kat Collings and I technically work out of the same office in West Hollywood, but she’s rarely in her seat, as she’s visiting our offices in London, scoping out new designers in NYC, and scooting off to appointments here in L.A.—when she’s not scoping out really, really good vintage finds in her free time. Still, she was kind enough to answer my questions, walk me through one of her favorite spring looks, and give me a peek inside her go-to spring handbag—the perfectly Parisian, perfectly iconic Guirlande de Cartier. Keep reading to see what she’s got stashed inside, and get her take on other must-know accessory trends for the coming season. Kat calls this look her go-to for pretty much every occasion (on the West Coast, anyway). 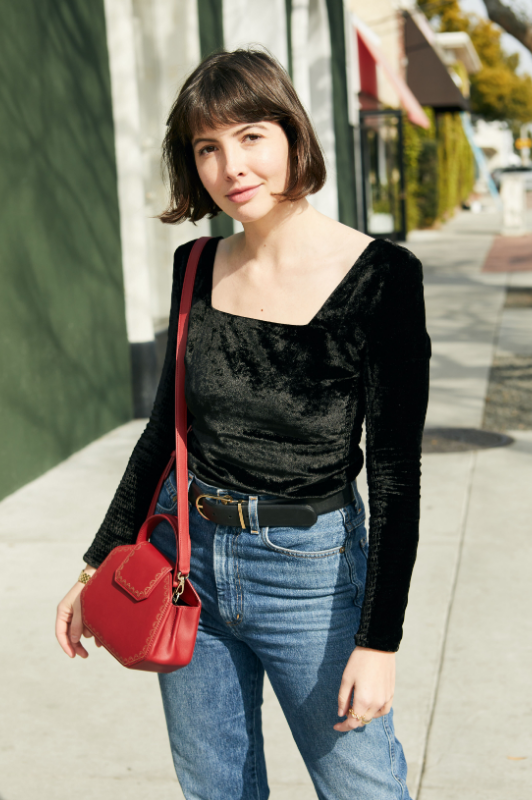 “The style rules are a bit more relaxed here,” she says of her fun square-neck velvet bodysuit, perfect vintage jeans, and Cartier red crossbody. “I could picture it for running errands, grabbing lunch with friends, or a casual Friday at work.” Speaking of her native state, she also says she’s looking forward to leaning into the season’s whole California-cool look (“crochet, a bit of tie-dye, surf inspiration”). On the topic of handbags, Kat tells me she owns at least 30—but admits that only five make her regular rotation. “This one carries your entire outfit, so you can get away with wearing more classic pieces,” she advises, adding that she loves its combination of form and function (two things she always looks for in a bag). When I ask for a peek inside her Guirlande de Cartier, I’m not surprised to find she’s a far more organized person than I am. “Lipstick, ChapStick, credit card holder (no bulky wallets allowed), keys, and cellphone,” she says. “That’s it!” At this, I also make a mental note to purge my own everyday bag of its unfortunate collection of loose change, old Metro cards, mismatched gold hoops, and five red lipsticks that are basically the same color. As for advice on where to begin when it comes to putting together a winning spring look? “Since it’s a transitional season, light layering is key. This blazer is easy to throw on in case I go straight from work to after hours events,” she shares (and I can say from observing her jam-packed schedule that this is highly likely).